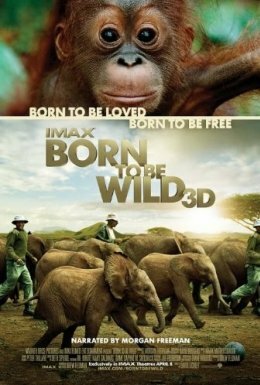 Warner Bros. and IMAX present Born to be Wild 3D, an inspiring story of love, dedication and the remarkable bond between humans and animals. This film documents orphaned orangutans and elephants and the extraordinary people who rescue and raise them—saving endangered species one life at a time. Stunningly captured in IMAX 3D, Born to be Wild 3D is a heartwarming adventure transporting moviegoers into the lush rainforests of Borneo with world-renowned primatologist Dr. Birute Mary Galdikas, and across the rugged Kenyan savannah with celebrated elephant authority Dame Daphne Sheldrick, as they and their teams rescue, rehabilitate and return these incredible animals back to the wild.